A symbol can always be studied from an infinite number of points of view; and each thinker has the right to discover in the symbol a new meaning corresponding to the logic of his own conceptions. Symbols are precisely intended to awaken ideas sleeping in our consciousness. They arouse a thought by means of suggestion and thus cause the truth which lies hidden in the depths of our spirit to reveal itself. In order that symbols could speak, it is essential that we should have in ourselves the germs of the ideas, the revelation of which constitutes the mission of the symbols. But no revelation whatever is possible if the mind is empty, sterile and inert. By their very nature, symbols must remain elastic, vague and ambiguous, like the sayings of an oracle. Their role is to unveil mysteries, leaving the mind all its freedom. The above quote by Oswald Wirth infers that there is a timetable for innate ideas to arise in human consciousness, ideas that are contained in the well of human superconscious - a knowledge matrix Aldous Huxley called Mind-at-Large. The timing of such revelation and disclosure, as we all know and feel in our bones, seems to be coming at a quicker and quicker pace in these strange times. The most profound of these latter day revelations is the one that has arrived through one simple "oracle" - a former doctoral student living in Gloucester, England by the name of Andy Lloyd. Lloyd's new book, Winged Disc - The Dark Star Theory, previously only available in web site installments, is now available directly from the author. This self-published tome contains 250 pages, including 46 illustrations. It is the illustrations that we are talking about here. If you look at these ancient symbols, you may wake up too - but you may soon long for the comfort of ignorance. In this volume, Lloyd reproduces Sumerian, Babylonian and Egyptian drawings as well as medieval alchemical paintings. These symbols contain information which apparently has been misread by scholars for many years. But with a stroke of genius guided by the synchronicity of revelation, Andy's roving mind was primed to interpret them for the world. The meaning of these symbols is literally earth-shattering and Velikovskian in import. The symbols essentially tell us that we live in a two-sun system. The other star, the "dark" one, has visited its wrath upon Earth many times and may be the source of Velikovsky's 1950 search, in his book Worlds in Collision, for a celestial "red demon" - a wrecking ball from deep space that gave rise to worldwide cultural reports of global deluge accompanied by fire, boiling seas, tidal waves, worldwide starvation and mass species death. The Dark Star, called Nibiru by the Sumerians and Marduk by the Babylonians, just may be the anomalous body that scientists now call Planet X, which represents both a tenth planet and an 'unknown factor.' They know something's out there because of a long-noted disturbance or 'wobble' effect on the outer planets of our solar system. Andy argues that this body is not a planet but a massive brown dwarf star, which glows in the infrared band, and would have appeared to be on fire to ancient Earth witnesses. According to Andy's research [see "Winged Disc" on page 9], Nibiru (Sol B) is on a "cometary" path and the description of its passage is as a monstrous red fireball with wings thrown back by the magnetosphere of our Sun: Sol A. This image gives rise to the prolific ancient symbology of the Winged Disc, symbols which are interspersed through Andy's book in an effort to clarify the tenable connection between myth and reality. According to the prolific author of the Earth Chronicles series, Zecharia Sitchin, the Sumerians left word of this enigmatic celestial body, telling us that its highly eccentric, elliptical orbit brings it into the vicinity of our otherwise serene blue globe about every 3,600 to 3,800 years. The orbital period of 3750 years finds a remarkable corollary in research conducted by Maurice Cotterell... Cotterell calculated a reversal of the Sun's entire magnetic field every 3750 years... The result is a reversal of the 'neutral sheet,' or local space around the Sun. Cotterell was unable to offer an explanation for this behavior beyond citing external influence upon the Sun. I suggest that the complex shape of the 'warped neutral sheet' is created by the Sun's periodic interaction with the brown dwarf Nibiru as it moves through the solar system. Nibiru's own magnetic properties might be the cause of the reversal of the Sun's polarity during the dark star's perihelion passage. Cotterell notes that similar numerical figures appear in Mayan records, particularly 'the Mayan super-number of 1,366,560 days recorded in the Dresden Codex.' This number corresponds to 3,741 years. Lloyd discusses recently detected "light-emitting planets," which are as small as five times the size of Jupiter. These light-emitting planets are "free-floating entities" that emit a dim reddish light and are much smaller than brown dwarfs. "Their properties seem to encapsulate those of Nibiru, but the difference is their age. Nibiru is billions of years old, and simply won't appear like a small star anymore. But looking at an image of these young, small brown dwarfs might provide a model of how Nibiru appeared when it first entered the solar system." "crashing through the planetary zone four billion years ago." "nomadic giant planet-sized entities wandering aimlessly between developing star systems, and perhaps becoming captured by these systems into erratic, eccentric orbits." Andy also proposes that if there were such Nibiruan visitors as reported by the Sumerians - giants with long life-spans known as the Anunnaki - they would likely not reside on an inhospitable brown dwarf star, but rather on one of its seven moons. "a world orbiting a dark star that is essentially invisible to us, but that emits massive amounts of heat and enough low-frequency light to support life, whilst not subjecting the denizens of that world to the sort of harmful radiation we are subject to from our Sun." He asks, "could this also explain the almost immortal life-spans that the Sumerians claim for the Anunnaki?" Interestingly, NASA appears to know something about this red cometary orb. 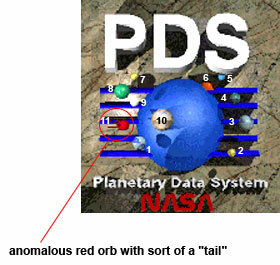 As Lloyd notes, NASA's Planetary Data System (PDS) logo shows all of the known planets in the solar system, along with one anomalous red orb with sort of a "tail." As Andy Lloyd explains, the number of planets depicted on the PDS emblem is 11, including the red comet-like body. If we used the Sumerian scheme of counting the planets, we would have nine planets, plus the earth's moon, plus the red comet. The huge Sun in the middle of the emblem, round which the other orbs rotate, makes 12. "The logo gives the impression of a modern design version of the famous Sumerian cylinder seal showing the planets of the Solar System. Even the order of the planets around the Sun seems in approximate accord, and one wonders whether the designer of the logo had this image in mind." Obviously, NASA knows more than it is letting on. One NASA spokesman indicated in 1999 that Planet X is out there, but they didn't want the public to think of it as "incoming mail." Andy Lloyd disagrees. If Planet X is Nibiru, our ancestors got mail, and we're definitely due for a big package. But when? According to new age web sites (like zetatalk.com), we should X-pect Nibiru in a couple of years, in or around the Spring of 2003. Other researchers suggest we will be seeing Nibiru within the next few decades based upon a synthesis of Sitchin's material with the writings of Immanuel Velikovsky. The year 2012 seems auspicious as well, since it marks the end of the Mayan calendar cycle. According to Sitchin's timeline, Nibiru is due to appear around 3440. But according to Andy, Nibiru is now at its aphelion, its furthest point away from Earth, and should not be X-pected our way until about 3750-60. The only thing we can be certain about is what goes around, comes around. "The enriching of intellect and its growth consist in the widening of its capacity for finding analogies." This is the hand of synchronicity at work. The 3rd dimension is the world of effects; here we will never truly know causes. Yet synchronicity as nonlocal cause can point us in the direction where the answers happen to coincide with our physical movements in the 3rd dimension. This is how we trip over analogies so profound we can't miss them. This is how critical information is imparted to the human consciousness when the time is right. In my opinion Andy Lloyd's material has arrived at a most profound juncture in human consciousness. When studied by equally serious minds, there is no mistaking the import.